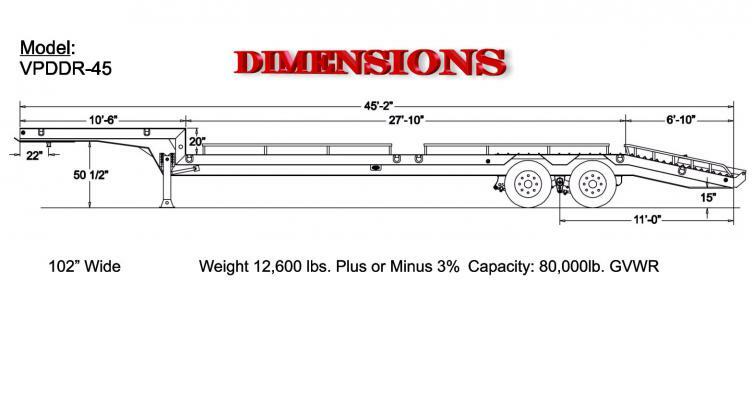 The Viking Equipment Transport Trailer was designed with a dual purpose in mind. 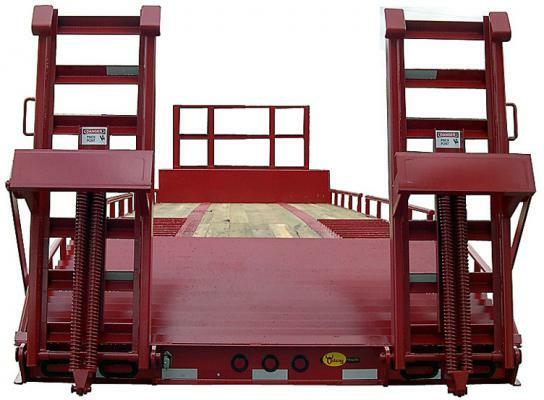 This trailer has the ability to haul equipment and palletized material together. For example: in most situations the forklift that is used to load the freight can also be loaded on the trailer as well. The ability to deliver freight and have the machine on board to unload it is a must in materials handling. If your day depends on the amount of material and the ability to unload it, the Equipment Transport will fit the bill. Capacity: 80,000 lb. GVWR. 16″ Fabricated beams, 1/2″ x 6: top flange, 3/4″ x 6″ bottom flange with 1/4″ web welded on both sides. All flange material is high strength steel. 6″ x 3.7# Jr. I-beam on 16″ centers. HUTCH H9700T three point spring suspension with hi-arch heavy duty 3 leaf springs. (2) 25,000 lb., 5″ round, 5/8″ wall. 16-1/2″ x 7″, Type 30/30 brake chambers, outboard drums, Meritor WABCO (2S/1M) ABS on one axle. 1-1/2″ Shiplap treated pine (standard). 1/4″ treated plate with 1″ traction bars over tandems. 7-Way main receptacle, sealed wiring harness, rubber mounted LED lights. 3 lights per side, including mid-turn.